It is broadly acknowledged that for America to compete in the global economy our schools must improve student performance in the areas known as STEM. Arizona is no different. As one small element of making a contribution to this effort, the Phoenix Section of the American Institute of Aeronautics and Astronautics (AIAA) has created this website to serve as a focal point for information on our Section’s STEM activities. 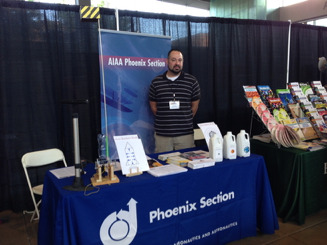 There is also a short list of STEM resources for the Phoenix area. This website is by no means complete, so I am soliciting visitors help in identifying other bits of information and links that should be added here. This site primarily hosts information about our local speakers bureau, wind tunnel project, and links to the national AIAA K-12 resources. For info on the Aerospace Educator Workshop we had on March 8, 2014, click on the "Educator Workshop" button to the left. Please note that due to personnel changes and obsolescence of the software used to generate this website, it will probably not get any further updates or additions. 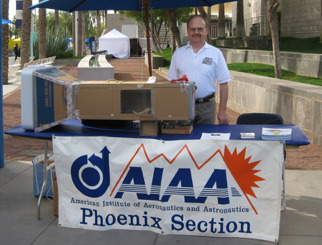 See the Phoenix Section main site at this link for the latest info on our STEM outreach activities.